There are indications that the Bush Administration is preparing to enact far-reaching emergency procedures in response to Hurricane Rita, which could potentially lead the country into a situation of Martial Law. Following his visit to Texas on September 23, President Bush traveled together with DHS Secretary Michael Chertoff to The Peterson Air Force Base, at the headquarters of US Northern Command in Colorado Springs. He spent the night of September 23 at Colorado Springs and was at US NorthCom headquarters on the morning of the 24th of September, when Hurricane Rita hit the Texas-Louisiana coastline. Headed by Navy Admiral Timothy Keating, US NorthCom is slated to play a central role in emergency operations. A Joint Task Force Rita has been created under the jurisdiction of NorthCom. Operating out of Austin, Texas, the “standing joint force heaquarters” in Texas is under the command of Army Lt. Gen. Robert Clark, who is in permanent liason with Admiral Keating at NorthCom headquarters. Created in 2002, NorthCom oversees the land, sea and air defense not only of the US but of the entire North American continent, including Mexico and Canada. In the wake of 9/11, its mandate directly responds and relates to the “threat of terrorist attacks”: its stated objective is to “defend the Homeland”. The presence of the President and Commander in Chief at US Northern Command Headquarters is of crucial significance. The federal emergency procedures are being coordinated out of a military base, rather than from the White House, in liaison with the various departments and agencies of the (civilian) federal government in Washington, D.C. THE PRESIDENT : ….Then I’m going to go out to our NORTHCOM headquarters to watch the interface between our United States military, and again the state and local authorities. Our job is to assist — prepare for and assist the state and local people to save lives and to help these people get back on their feet. Again, I want to thank the people here in Washington who are working with the folks in the — out in the field to do everything they possibly can to prepare for this second big storm that’s coming into the Gulf of Mexico. Q Sir, what good can you do going down to the hurricane zone? Might you get in the way, Mr. President? THE PRESIDENT: One thing I won’t do is get in the way. Q But I mean, how — what good can you actually do? I mean, isn’t there a risk of you and your entourage getting in the way? THE PRESIDENT: No, there will be no risk of me getting in the way, I promise you. We’re going to make sure that we’re not in the way of the operations. What I am going to do is observe the relationship between the state and local government, particularly out in Colorado Springs. That’s what I want to see. See, NORTHCOM is the main entity that interfaces, that uses federal assets, federal troops to interface with local and state government. I want to watch that relationship. It’s an important relationship, and I need to understand how it works better. Q But critics might say this is overcompensation for the response to Katrina. THE PRESIDENT: We will make sure that my entourage does not get in the way of people doing their job, which will be search and rescue immediately. And rest assured, I understand that we must not and will not interfere with the important work that will be going forward. “A spokesman says his Colorado Springs visit will ‘give him a better grasp of federal preparations for the storm'”. The response to the national disaster is not being coordinated by the civilian government out of Texas, but from a remote location and in accordance with military criteria. US Northern Command Headquarters will directly control the movement of military personnel and hardware in the Gulf of Mexico. As in the case of Katrina, it will override the actions of civilian bodies. Yet in this case, the entire operation is under the jurisdiction of the military rather than under that of FEMA. Until the 24th of September, there was no indication, from official and/or media sources of Secretary Rumsfeld’s participation in the NorthCom meetings. According to the DoD, Secretary of Defense Rumsfeld and Acting Deputy Secretary of Defense Gordon England “have no public or media events on their schedules” from the 22nd to the 24th of September. 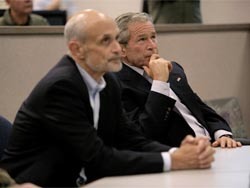 It is now confirmed that a top level meeting was held under NorthCom auspices, which included the participation of President Bush, Defense Secretary Don Rumsfeld (through video call), DHS secretary Michael Chertoff and FEMA Director Vice Admiral Thad Allen (video call). This meeting had been planned well in advance. US public opinion was not informed. It was not mentioned by president Bush at his September 23 Press Conference. (see above). The emergency procedures will be closely coordinated by US Northern Command out of the Peterson Air Force Base, together with Homeland Security, which oversees FEMA. What is unfolding is a national rather than a regional emergency scenario, under the control of Northern Command. Moreover, in the wake of Hurricane Katrina, a total of 42 states and Washington, D.C. have enacted emergency procedures, even though most of them were not directly affected. In addition to defending the nation, U.S. Northern Command provides defense support of civil authorities in accordance with U.S. laws and as directed by the President or Secretary of Defense. Military assistance is always in support of a lead federal agency, such as the Federal Emergency Management Agency (FEMA). Military civil support includes domestic disaster relief operations that occur during fires, hurricanes, floods, and earthquakes. Support also includes counter-drug operations and consequence management assistance, such as would occur after a terrorist event employing a weapon of mass destruction. Generally, an emergency must exceed the management capabilities of local, state and federal agencies before U.S. Northern Command becomes involved. In providing civil support, the command operates through subordinate Joint Task Forces. (See US Northcom website at http://www.northcom.mil/index.cfm?fuseaction=s.who_civil ). Homeland Security Secretary Michael Chertoff subsequently classified Hurricane Rita as an “incident of national significance,” which justifies the activation of a so-called “National Response Plan”(NRP). The National Response Plan (NRP) is effective upon issuance with a phased implementation process during the first year. During the first 120 days of this implementation process, the Initial NRP (INRP), Federal Response Plan (FRP), U.S. Government Domestic Terrorism Concept of Operations Plan (CONPLAN), and Federal Radiological Emergency Response Plan (FRERP) remain in effect. The entire Homeland Security construct is based on the “Global War on Terrorism” (GWOT). The underlying procedures are not intended to deal with natural disasters. In this context, the national disaster could provide a justification for a greater role of the Military in civilian affairs, exerted through Northern Command. This role would extend beyond the implementation of relief efforts in the Gulf of Mexico. The NRP involves concrete provisions which describe the role of the Military in the case of a national emergency. Under the Defense Support of Civil Authorities (DSCA), the Military could assist civilian bodies in law enforcement activities, thereby leading to the derogation of the Posse Comitatus Act. Although the preliminary reports are incomplete, the civilian response capabilities seem to exhibit serious shortcomings, as some 2 million people flee Southern Texas and Louisiana including the Houston Metropolitan area, which has a population of some 4.7 million people. We are not, however, dealing with a situation of political inertia, Quite the opposite. The military has taken control of the emergency procedures. The scale of military involvement is far greater than that observed in the case of hurricane Katrina. Northern Command, rather than the Federal Emergency Management Agency (FEMA) is already slated to play a central role in overseeing the emergency operation, namely the military will intervene directly in civilian affairs under procedures which have already been carefully laid out in a number of official documents. President Bush is the Commander in Chief and what is unfolding at the Peterson Air Force Base in Colorado Springs is the planning behind closed doors of a major military operation on US soil. Moreover, this operation is being launched on the same day as major antiwar demonstrations across America. 24 Sept 2005, 02.30 am EST, revised 9.45 am EST, updated 15.45 pm EST, excerpt from Bush 23 Sept press conference added 25 Sept, 11.50am EST. Michel Chossudovsky is Professor of Economics at the University of Ottawa and Director of the Centre for Research on Globalization (CRG), He is the author of a America’s “War on Terrorism”, Global Research, 2005.